Honey, will you enter the wife-carrying race with me? How weird are humans? I just had to share this article about an actual wife-carrying race from the Finnish American Reporter. If you’ve read my earlier post on ancestry, you’ll know I am a died-in-the-wool Finlander at heart, but this little story left me speechless. I’ll have to ask my mom if our ancestors did this for fitness. Read on…. Sonkajarvi, Finland — Ville Parviainen and Sari Viljanen from Vantaa trounced the competition to take Finland’s 2015 wife-carrying world championship in Sonkajarvi, eastern Finland on Saturday. The result was the second consecutive win for Parviainen who competed with a different partner in 2014. Villa Parviainan and Sari Viljanen beat the competition’s demanding obstacle course in a time of just over one minute (1:02) to take the 2015 world championship. Last year Parviainen teamed up with Janette Oksman to complete the race in a similar time — albeit one second slower — to win the championship. Parviainen has attributed his winning series to his participating in cross-training. Previous winner Taisto Miettinen placed second with his partner Krista Haapalainen, while third place went to the Russians Sagal Dmitriy and Loginova Anastasia Moskova. Other winners in this year’s competition included the Estonian couple Janno Sild and Anu Viljandi, who won the senior’s category in a time of 1:31.Victors in the team event were Toni Hynynen, Mika Suomalainen, Joni Juntunen and Jaana Haavikko. Teammates are not required to be legally married. Helmets are required in the World Championships but not in the North American event. Wife must be at least 17 years old. Wife must be no less than 49 kg. If she is less, weight will be added. This sport is catching on. The international competition fielded teams from Estonia, Russa, Lithuania, France, Sweden, Norway, Australia, Germany, Canada, Denmark, Belgium and Japan. But wait, there’s more. Check out the website for the Wife-Carrying World Championship. 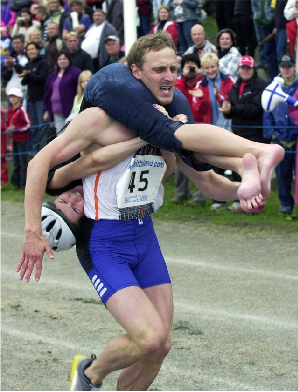 I also just learned there’s a North American Wife Carrying Competition. Reallllly? That’d be a much closer flight than Finland….. I think the four of us should enter!!!! Thank You for this post. Someday I will visit to Sonkajärvi. Thank you, as always, for reading! I am moving my site and posts over to richerliving.net. Please feel free to check it out!